Hi friends! Gosh, I still can't believe it's June already! I have to pinch myself every day! 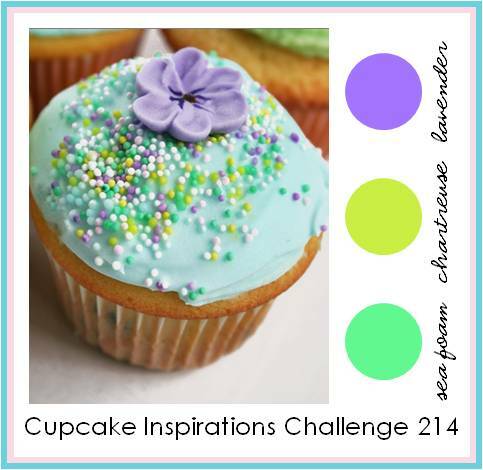 I've got a simple little card today for this week's Cupcake Inspiration Challenge. Aren't these colors just fabulous? This week's challenge over at Cupcake Inspirations is being sponsored by a brand new sponsor - Taylored Expressions! Working with this sponsor was extra special for me because it gave me a chance to reconnect with my gal pal, Regina. *grin* Regina was one of my first web buddies when I started stamping. A former Stampin' Pretty Pal, she is now part of the fun over at Taylored Expressions! Although Taylored Expressions has some adorable cupcake images, I decided to go sans cupcake for this card. I winced a little when I cut the little cutie out from the image that I used from Sweet Bliss, but the letters were all I needed. They L, V, and E are on Summer Starfruit card stock. For the O, I used some pretty Flower Trim, inked with Lavender Lace, a retired SU! color. I adhered my letters onto a Martha Stewart doily and used dimensionals to adhere it to my PS Pool card, covered with some Dotty Biscotti patterned paper from Papertrey and some dotted scallop ribbon border in Summer Starfruit. I trimmed the top corner with my rounded corner punch, then added some pretty purple ribbon from my stash to tie up the card, and I was done! I reside in Maryland with my hubby and sweet Basset Hound, Molly. As a work-a-holic School Counselor, I rarely find time to create, but crafting is in my blood! I come from a family of crafty women and have been crafting inadvertently since I was about 2 years old. Between my mom, aunt, grandma and I, we paint, sew, scrapbook, do needle crafts, make jewelry, and more! This is my little space to share my hobbies with the world! All supplies used are Stampin' Up! unless otherwise noted.